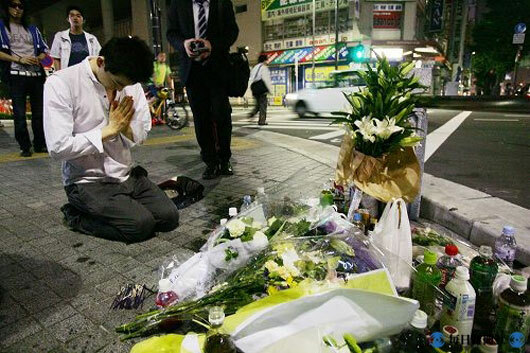 The mass murder in Tokyo’s Akihabara Electric Town has left the nation in shock… a 25-year-old man turned rampage on Sunday noon, killed seven and injured 10 before he was arrested by the cops. The violence began when the murderer crashed a rented truck into pedestrians, and then jumped out of the vehicle and started stabbing the people he had knocked down before turning on horrified onlookers until he was apprehended. Three people were killed by the impact of the truck and four from stab wounds. The murderer had been posting his attack plan on a mobile phone bulletin board since Sunday early morning… obviously nobody was taking him seriously until the attack. Japanese media is pulling together the postings and police statements, and drew a picture of an angry, lonely young man who meticulously planned the deadly attack. It’s a sad thing to read, reminds me of the Columbine and Virginia Tech massacre… the saddest thing is that we might be seeing similar random-mass-attack in near future around the world. My condolences to the victims’ family and friends.